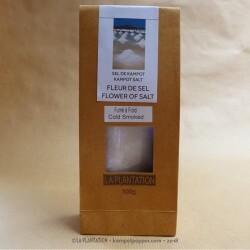 Flower of Salt There are 5 products. 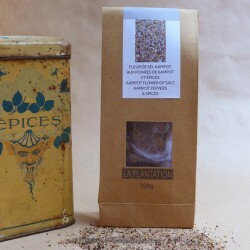 A ready-to-use spice blend of Kampot's Flower of Salt with Smoked Sweet Long Chili, Black Kampot Pepper, Dried Garlic and little Bird Chili. The slight smoky taste brings a distinctive aroma and a delicate flavor. Available in 50g recycle paper pack for amateurs.